Reem is one of the most inspiring for me, she is humble and so sweet. Best Design Business from the Mohammad Bin Rashid Awards for Young Business Leaders. Who is reem, Tell us more about yourself? Who is Reem? That’s a very good question. I would have to say that I am not as serious as everyone happens to think I am. I do take my work seriously and I’m very hands on in everything from marketing plans, advertising, budgeting, and managing but as a person I’m very shy and kind hearted. Growing up I have always had a passion for designing and use to use Hind as my play doll and loved playing dress up. When it comes to my family I can always depend on them. They encouraged me to peruse my dreams and have been there for me from the very beginning and believed in me. Reem, you are a wife, a mother, a businesswoman, a designer, how you manage that? Let me start off by saying that I am truly blessed and couldn’t be any happier now that I’m a mother to my beautiful daughter. Managing all these tasks at once is a handful but believe it or not I work my schedule around my family, so if I have to bring my work home in terms of photo shoots and designing, better believe I do. I also have a great team working for me at DAS and my sister Hind helps me as she takes care of the office and staff. You made some study design, but you are interested in fashion. How did the DAS collection business come about? DAS was created when I started creating my own abayas for my sisters and I to wear at family weddings. We would receive so many compliments that it had me thinking that I can actually do it. And with the support of my family I than started creating my own fashion line. The abaya has remained pretty much unchanged for long time, DAS COLLECTION have made changes to the abaya with bold colours, materials like lace and leather, and even add sequins, embroidery. This style has been well accepted ? I believe that it has been accepted as everyone is aware that the very bold and daring colors are meant to be worn for special occasions. 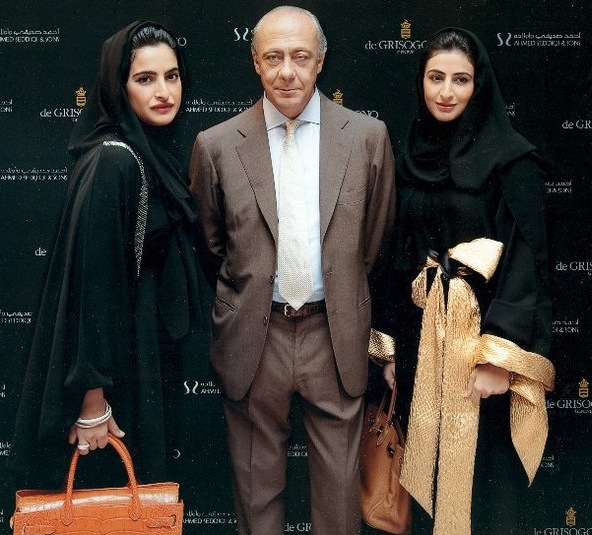 I had the chance to wear one of your abaya, it's elegant, comfortable, and perfect fit. What do you do to find inspiration? We look to place like Morocco , travelling really inspires me a lot as you get to see other people's tradition and culture. and my whole surroundings are my inspiration. In an earlier interview you talked about your desire to work with louboutin, did you start working your project with him? Let’s say for now that there are many projects to come that will surprise everyone. I will definitely have to agree with you on that one as I would love to see Angelina Jolie wearing DAS. She’s not only an A list actress but an icon as well. Do you ever disagree on anything with Hind? We’re sisters so we definitely have had our disagreements but we manage to work things through and find a way to make it right. You have achieved a lot of things, what's the next for Reem, Can you tell us a little about your upcoming projects? Having DAS at Harrods is one of my proudest moments and achievements. My future projects are targeted in wanting to have DAS very well known internationally and on international fashion runways. The interview was done a few days before the birth, thank you to Reem for your patience and her assistant Deena for your help. Welcome back, sister! I've missed you, really. I noticed you removed your Facebook fan page. May I ask how I should discuss business/personal things with you? What's the best method for you? Thank you. It's wonderful to see new designs coming out all the time. I didn't remove my facebook fan page, but just disable my private account.You can contact me on hijabsandco@gmail.com,or my twitter account. Look forward to hearing you.